ONEPLUS 3T upgraded version of ONEPLUS 3 has been launched after six months of its predecessor, with more advanced features, is probably the best handset you can get for $440. Featuring the latest Snapdragon 821 processor, makes it achieve faster speed and smoothest Android experiences with 6 GB of RAM with lots of apps running in the background, makes it worth its price. The earlier ONEPLUS 3 was also fast and outpaced LG G5, Samsung Galaxy, HTC 10 and didn’t need much improvement, but 3T beats 3 in the same bench mark, it is just as fast as Le Eco LePro3 and Google Pixel the latest phones which have the same Snapdragon 821 processor like that of 3T and so it is the best phone in the market. With absolutely fantastic performance ONEPLUS 3T is a device that handles graphic- intensive gaming very comfortably. Apart from this, opening, closing and switching in between apps and the touch responsiveness of 3T is very smooth, snappy and excellent. Battery is another aspect where ONEPLUS 3T has upgraded itself with 3,400 mAh battery whereas, ONEPLUS 3 has 3,000 mAh unit, so comparatively it is more impressive without making the phone heavier or thicker. The Dash Charge technology available in it provides back up to a full charge in a short span of time and lasts for the whole day, even after heavy usage. Regarding camera, the front facing shooter is 16 MP units which are double than that of ONEPLUS 3, but the rear camera is the same. 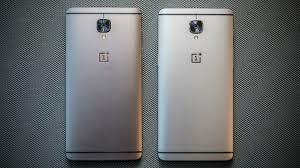 In looks it is not a very wide or tall phone, only slightly larger than Samsung Galaxy S7 Edge with 5.5 inches display, but the only way to distinguish with Older ONEPLUS 3 is by its colour, which is in the same gold variant and other option is gunmetal instead of silver. Facing direct competition with Le Eco Le Pro3, ONEPLUS 3T is a refinement, well planned and executed, which results in price hike, but the end product and the user’s experience, makes it worth the extra money and is probably considered the best deals you can get for an Android flagship.